The artwork was designed by former Glasgow School of Art student Andy Scott. A statue of Charles Rennie Mackintosh has been unveiled on the 90th anniversary of his death. 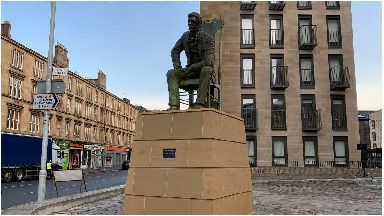 The sculpture features Mackintosh sitting on the famous high-backed chair he designed for Glasgow's Argyle Street Tea Rooms. First Minister Nicola Sturgeon formally unveiled the statue, located on the corner of St Vincent Street and Elliot Street in Glasgow city centre, on Monday. 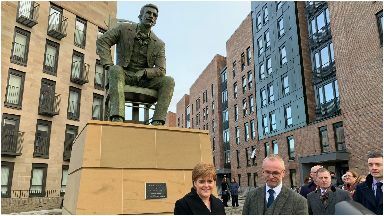 Ms Sturgeon said: "This magnificent new Charles Rennie Mackintosh statue is a fantastic addition to Glasgow and recognises the incredible legacy of one of Scotland's most iconic architects, designers and artists. "It is a privilege to officially unveil Andy Scott's installation, which now stands in pride of place in Anderston." Mr Scott said that the influence of Mackintosh has helped to shape his career as an artist. "Most of my memories as a Glasgow School of Art student have Mr Mackintosh's beautiful building as a backdrop," he said. "His distinctive architectural styling and the sculpted detailing of that building undoubtedly influenced my career path. "I am immensely proud to have created this distinctive bronze statue of him, especially here in his home city. "There can't be many Scots who deserve recognition more than Charles Rennie Mackintosh. "I hope the sculpture becomes a much-loved local and city-wide tribute to this genius of Scottish architecture." The statue was commissioned by housing association Sanctuary Scotland to mark its 10-year project to regenerate the Anderston area of Glasgow. The project saw many 1960s blocks demolished and replaced with 540 high-quality, affordable homes. Craig Moule, of the Sanctuary Group, said: "We believe Andy's statue is a fitting way to mark the completion of Sanctuary's regeneration of Anderston. "We couldn't have asked for a more apt artwork to acknowledge all that is great about Glasgow. "The thousands of people who'll pass the statue each day will help to ensure Mr Mackintosh's memory lives on."